Following the UK Court of Appeal ruling, Apple had to put a clear statement on its website saying that Samsung didn’t infringe on the iPad patents. And Apple did, but in a way that wasn’t what the judges really had in mind. 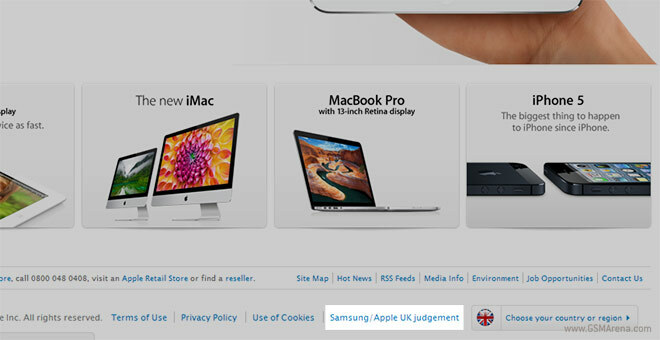 According to the official ruling, the guys from Cupertino had to clearly state on their UK website that “Samsung didn’t copy” the company’s designs. Instead, Apple posted a few paragraphs explaining in long how despite the UK’s ruling, courts in the US and Germany acknowledged that Samsung did infringe the company’s highly popular tablet. And that’s not what the court ordered. Now, infuriated by Apple’s poor execution of the order, the UK Court has given the company 48 hours to carry out the ruling the way it was intended: publish on its front page with a link to the corrected statement in a font no less than 11 points. As Bloomberg reports, Apple’s lawyers argued that this couldn’t be done in just 2 days and it’d need 14 days to make the changes. However, the judges weren’t having any of that and in the end, in two days we’ll be witnessing how Apple is eventually going to handle the situation with its UK website.